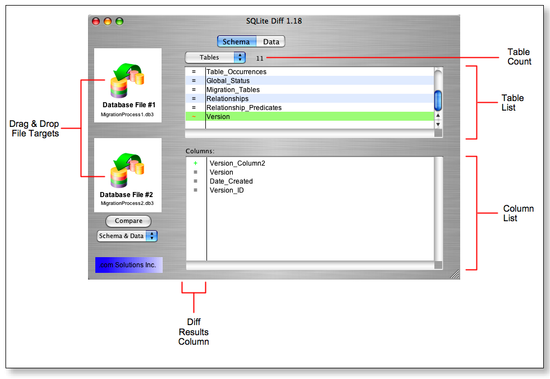 Products - .com Solutions Inc. - SQLite Diff - The comparison tool for SQLite. Compare SQLite schema and data. Quickly compares SQLite schema: Tables/Columns, Triggers, Views, Indexes. Record by record data comparison between each file. Colorized SQL and Data highlighting makes it easy to see changed SQL and data. Optimized for analyzing undocumented or poorly documented SQLite schemas. Fast in-memory schema comparison - runs fast even on older computers. Cross-platform compatibility with MacOS X and Windows. The only SQLite comparison tool on the market - no need to write your own tool. Instantly drill-down to see comparison details for SQL and data. 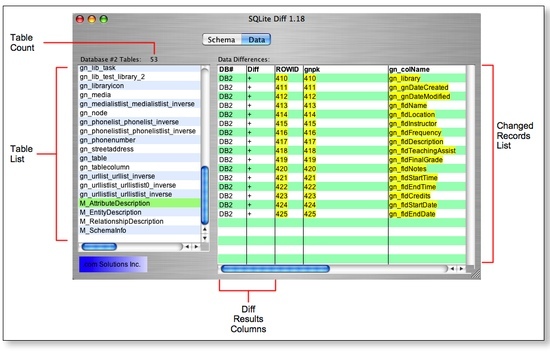 SQLite Diff is a graphical comparison tool for SQLite database files, comparing both the schema and the data. Schema results include comparisons of tables/columns, triggers, indexes and views. 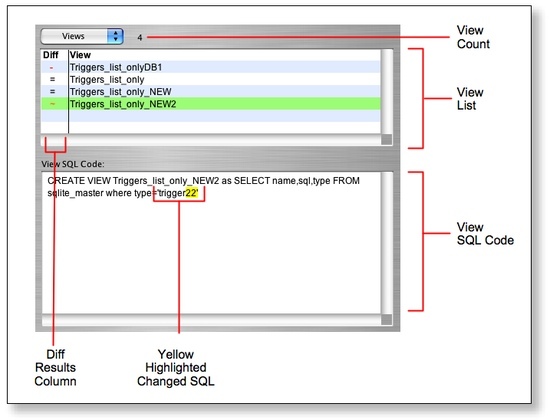 Changed SQL code including trigger SQL, index creation SQL, view creation SQL code and changed data records are displayed with yellow highlighting to make it easier to see the differences between the compared files. Comparing two SQLite database files is as simple as dragging and dropping the files onto SQLite Diff and pressing the Compare button. The schemas of each file are compared and the results are displayed in a few seconds. Clicking each object (Table, Trigger, View or Index) instantly displays the detailed results for the selected object. SQLite Diff first compares lists of tables by name between the two database files. Then the column names are compared between between the two SQLite database files. SQLite Diff first compares lists of triggers by name between the two database files. Then the trigger creation SQL code is compared for triggers having the same name within both of the SQLite database files. 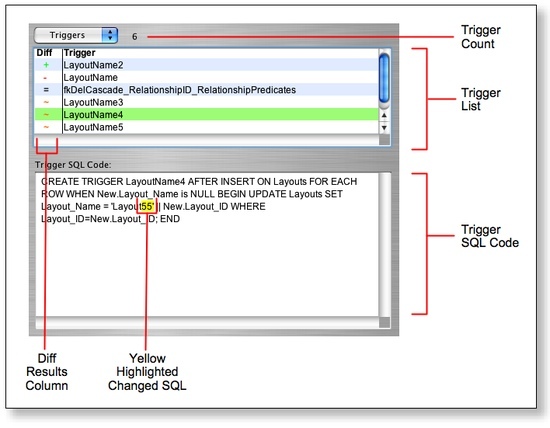 Changed trigger SQL code is displayed with yellow background, as shown in this first screenshot. 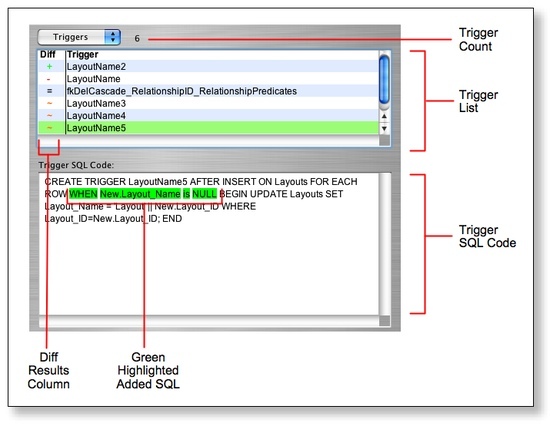 Add trigger SQL code is displayed with a green background, as shown in this screenshot. The green text background means that the highlighted SQL code was added to the trigger in the 2nd database file. SQLite Diff first compares lists of indexes by name between the two database files. 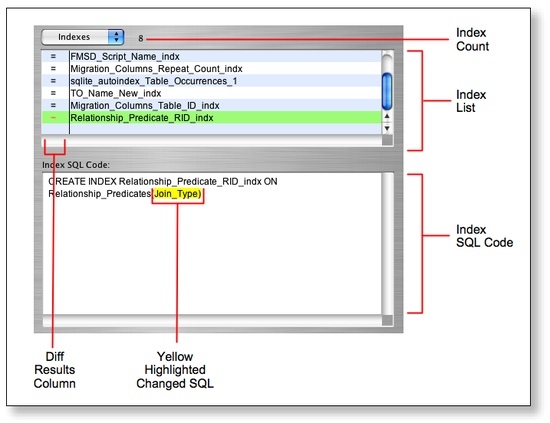 Then the index creation SQL code is compared for indexes having the same name within both of the SQLite database files. Changed, added or deleted index creation SQL code is displayed with a colorized background in order to make it easy to spot changes. SQLite Diff first compares lists of views by name between the two database files. Then the view creation SQL code is compared for views having the same name within both of the SQLite database files. Changed, added or deleted view creation SQL code is displayed with a colorized background in order to make it easy to spot changes. SQLite Diff uses the SQLite ROWID value to compare each record between each of the database files. The tables list contains summary info displaying the difference count and number of records found in each source database file. Clicking on an individual table displays the added/deleted/changed records as a comparison between first database (DB1) and the second database file (DB2). Changed records are listed with two rows of information. A row of info is shown for DB1 and DB2 and the changed data is displayed with yellow highlighting.